They don’t make them any better than Norberto H. A member of the ITST since July 2004, Norberto H excelled at Top Spin 1; ranked third at the conclusion of the ITST’s inaugural tour. The Austrian was even better on the Top Spin 3 courts, and for his performance there the ITST has inducted Norberto H into it’s Hall of Fame. In 2011 Norberto achieved what no other player has ever achieved as a member of the ITST. When the TS3 tour reached it’s conclusion, Norberto was ranked No. 1 on all three circuits; men’s singles, women's’ singles and men’s sim. Norberto was clearly dominant on all three venues, however his gaudiest numbers - numbers that will accompany Norberto to the ITST Hall of Fame - were achieved playing the men’s singles tour. Over the course of his TS3 career Norberto posted a match record 249-55. Five of the victories resulted in Grand Slam titles; ten in Masters series championships. 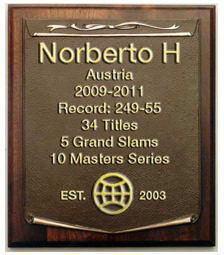 All told, Norberto collected 34 titles while posting a winning percentage of 81.9. In 2010, the last full year of TS3, Norberto was 99-9; a winning percentage of 91.7. Norberto's numbers were eclipsed only by his attitude and sense of fair play. No other player in the history of the ITST has held the game and the principles of the ITST in such high regard. While fiercely competitive, his attitude, win or lose, was always positive. A rare quality for a player of his ability. As such, the ITST is honored to have Norberto H as a member of it’s Hall of Fame.